The True Gossip Home / trace cyrus demi lovato boyfriend girlfriend dating relationship mitchel musso talks about twitter updates / TRACE CYRUS AND DEMI LOVATO DATING- CONFIRMED? TRACE CYRUS AND DEMI LOVATO DATING- CONFIRMED? Could it be true? Miley Cyrus' brother Trace Cyrus is dating Sonny With a Chance star Demi Lovato? The two have been sending each other some very flirty tweets. 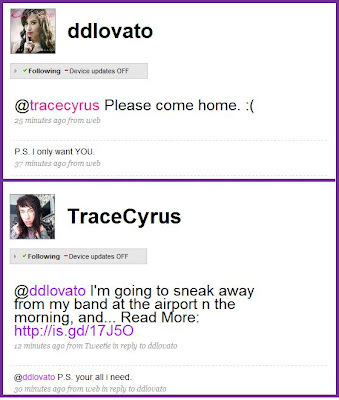 Demi recently tweeted Trace saying, "@tracecyrus Please come home. :("
Mitchel Musso also commented on the new relationship. He told M Magazine, "Demi and Trace dating? It's funny because I know them both really well, but I haven't heard that yet. Maybe, that would kind of make sense, I guess that would make sense. I know just as much as you do. When some one's over 18 and the other person's under 18 [Trace is 20, while Lovato is 16], especially if the girl is under 18....Miley and Justin. It's just like nothing bad to say about it but it's kind of weird but whatever."